This research analyses the implementation of Merauke Integrated Food and Energy Estate (MIFEE), which was launched in August 2010 by the Indonesian government. Within this broad context, the study aims to understand the external (international) and internal (national and regional) factors that influenced the launching of MIFEE in Merauke, Papua. Therefore, it looks at historical/ political aspects, rules and regulations, economic policies, and identity issues to understand the struggles of indigenous people in Papua particularly Malind people, who are mostly affected by MIFEE. The research combines neo-liberalism and capitalism forces responsible of the economic policies and development strategies undertaken in Papua, but also decentralization and social conflict between central and local government which facilitate such condition. Fragmented societies, various interest and power struggles in Papua further marginalize indigenous people in the area and add up to past oppression, exclusion, and grievances. This paper finds that all the forms of protests aims to defend their land ultimately their cultural identity as Malind people specifically. When this continually is ignored, Papua in general would remain volatile, and could increase violence in Merauke particularly where MIFEE is being implemented. Relevance to Development Studies The creation of MIFEE is part of the Papua Economic Corridor of Masterplan for Acceleration and Expansion of Indonesia Economic Development (MP3EI). The corridor’s objective is to accelerate development as well as alleviate poverty in Papua. This hegemonic discourse of development derives from neo-liberalism approach in which this research aims to review and analyze. The research findings reveal several factors from laws, economic policies, and power relations between stakeholders that facilitate capitalist forces. 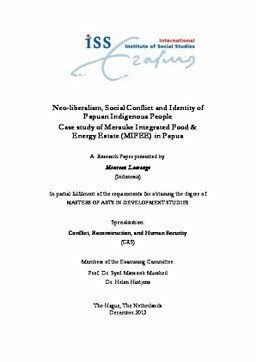 This paper aims to find the roots of conflicts in Papua particularly impacts of MIFEE towards land and identity of Papuan indigenous people.